Congratulations! You successfully collected valid email addresses from people who have given you permission to email them from time to time! This is no easy feat, as you know. In fact, procuring a valid, permission-based contact list is one of the most difficult tasks a marketing team can face. And once you’ve got that list? Well…you better handle with care. Chances are that if you push your luck too far, some of those agreeable contacts may end up getting annoyed and marking your emails as spam. And that’s never a good thing. So what is a good strategy for effective timing of email marketing campaigns? How do you know when you’re emailing just enough but not too much? Well there is an exception…the period of time at the beginning of this “relationship” – the on-boarding process – when they’ve just opted in and are getting acquainted with your site or services. You definitely can send a welcome email and maybe even a follow up email a few days or a week later. Just like with a budding off-line relationship, it’s acceptable to check in frequently at the beginning to ensure the relationship continues. But once you’re settled in…it’s time to ease up a little. We’ve developed a handy list of guidelines for you to refer to if you’re ever in doubt. Have you emailed your contact list in the last 24 hours? Have you emailed them in the last week? Did you email them this morning? If you answered “yes” to any of those questions, then it’s safe to assume you probably shouldn’t be emailing them again right now. Have you published a new release with major changes that need to be explained? Do you have enough material for this email to be considered a monthly or quarterly update newsletter? 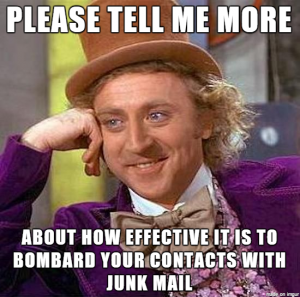 Have your contacts agreed to receive email from you on a daily or weekly basis? If you answered “no” to any of those questions, then it’s safe to assume you probably shouldn’t be emailing your contact list right now. Bottom line? It’s important to map out your email marketing strategy as soon as you set up your list. Before you even send out your first mass email campaign, you should sit down and map out your goals and intentions. Depending on the content you have to share and the nature of your business, a daily or weekly email could be acceptable if your contacts agree up front to receiving that much communication from you. Otherwise, a good rule of thumb is to aim for really juicy, information-packed emails that are sent out once a month or once each quarter. If you don’t have enough content to make a monthly newsletter REALLY worthwhile, then save it for a quarterly newsletter. Shara is a graduate of the University of North Carolina at Chapel Hill (Go Heels!) from the School of Journalism and Mass Communication. She earned an International MBA from Bar Ilan University and has held various marketing positions with start-ups and technology firms. In her free time, she enjoys traveling, photography and spending time with her family.